Defra Ministers have told the Europe Union’s Agriculture Commissioner that his draft proposals to reform the CAP fall short of meeting the key challenges he correctly identified some months ago - to make farming more productive and protect the environment. Ahead of negotiations in Brussels today on the proposed reform of the Common Agricultural Policy - which, at £47bn, made up nearly half the total EU budget last year - Environment Secretary Caroline Spelman led a delegation of Ministers from across the UK to meet the European Agriculture Commissioner Dacian Ciolos. “The Commission was right to identify the challenge of food security and climate change but has failed to respond adequately to the huge opportunities presented by rising prices. The UK wants significant reform of the CAP so that, over the long term, farm production is not reliant on direct subsidies. The UK also wants farmers to be better rewarded for the valuable benefits they provide, for wildlife, people and the landscape, that are not rewarded by the market. 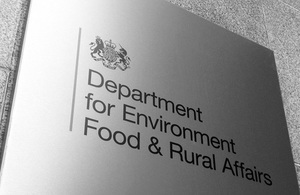 Defra Ministers are participating actively in negotiations following the publication of reform proposals by the European Commission. At the EU Agriculture and Fisheries Council in Brussels today, Defra Ministers will be meeting counterparts from other Member States to build alliances on areas of shared interest. “We remain convinced that the best way to help the environment is through the current system of specific environmental payments to farmers, in return for the public goods they provide, such as encouraging wildlife on their farms. “The proposals for the ‘greening’ of direct support payments, which aren’t currently linked to environmental protection, need far more work before they can be effective - and before we could accept them. At best they would simply reward farmers for what they already do and at worst prevent them from becoming more sustainable. Defra and the Devolved Administrations agree on many issues on CAP, including national flexibility, the importance simplification and that rural development schemes are the best way to secure environmental benefits. Present at today’s meeting in Brussels were; Caroline Spelman (Environment Secretary, Defra); Jim Paice (Agriculture Minister, Defra); Richard Benyon (Fisheries Minister, Defra); Alun Davies (Deputy Minister for Agriculture, Fisheries, Food and European Programmes, Welsh Assembly Government); Richard Lochhead (Cabinet Secretary for Rural Affairs and Environment, Scottish Government); and Michelle O’Neill (Minister for Agriculture and Rural Development, Department of Agriculture and Rural Development, Northern Ireland Executive).